Are you looking for Nishal Chandra's second marriage photos? 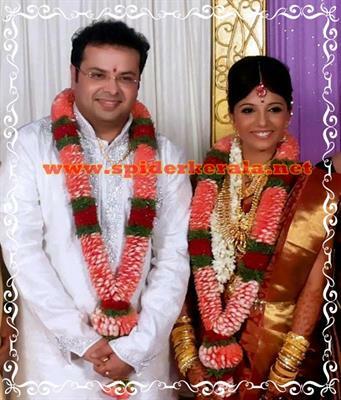 Nishal Chandra's second marriage with Remya took place at Mavelikkara, the home town of the bride on 13th May 2013. Nishal Chandra, the former husband of malayalam actress Kavya Madhavan got married to Remya who is an IAS officer of Karnataka Cadre at the Farm house. A grand reception too was held at Thiruvanthapuram. Chandra, the former husband of malayalam actress Kavya Madhavan tied the knot with Remya, an IAS officer of Karnataka Cadre. The marriage took place at the farm house of the bride on 13th May 2013 at Ennakkad near Mavelikkara. A grand reception too was held at Thiruvanathapuram today. Sources close to us tell that Remya has graduated from Thiruvanathapuram has completed her post graduation from Banglaru. Remya who hails from Budhanoor Ennakkad is the daughter of Thekkemadathil Surendra Nath Swamy and Anila S Nath. Nishal Chandra, who works in Kuwait, is the son of Chandra Mohan and Mani settled at Kumarapuram, Thiruvanathapuram. Kavya Madhavan who got married to Nishal on 5th February 2009 at Kollur Mookambika Temple went to Kuwait with her husband. But later she returned back to Kerala alleging mistreatment from her husband and his family. After the couple was not able to live together due to irreconcilable differences, a settlement was made between them. As per the made between two parties, Kavya decided to pull out the petition filed against Nishal and his family under the Domestic Violence Act. A 'No Objection Certificate' was produced before the High Court and the couple legally got divorced on May 2010. Nishal Chandra who is having master's degrees in telecommunication engineering (Stevens Institute of Technology in New Jersey) and a degree in management science (Stanford University, California), is currently working as the finance consultant of an important bank in Kuwait. Kavya Madhavan on her return to silver screen has acted in few movies.